Lion Marc's turned aluminum gun barrel with thread protector. 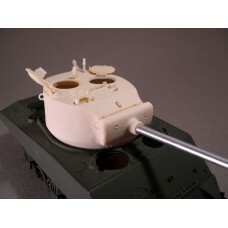 Accurate casting numbers and foundry marks on the turret shell, gun mantlet, and separate pistol port door. Subtly reproduced cast texture on parts. Highly detailed all round vision cupola (F073). Includes highly detailed periscopes ,M.G. mount, M.G. travel lock, and rear turret M.G. stowage brackets.